To make your journey as smooth as possible and avoid unnecessary delays, we ask that you read our security procedure. All passengers must pass through security control before boarding your aircraft on aircraft over 10 tonnes. Private jets such as Embraer Legacy 500, Hawker 800XP, Embraer Legacy 650, Gulfstream G550 and Dassault Falcon 900EX to name a few. 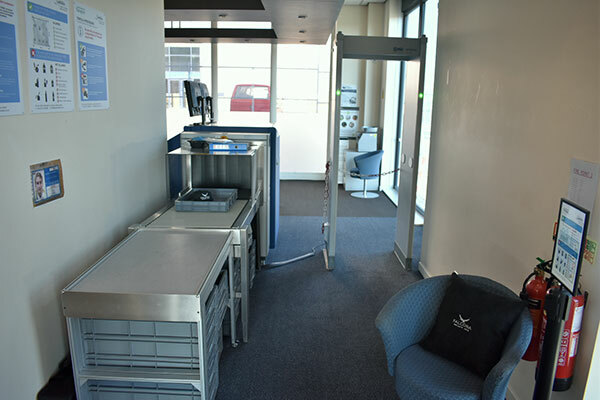 Prior to your booking we will notify you of the time you need to arrive at the terminal to ensure you get through security screening as quickly as possible. We would remind all passengers that each operator has their own policy regarding the amount of hand baggage allowed on their aircraft and we strongly recommend that information regarding this is sought directly from the operator before travel. It is best to prepare your liquid bag no larger than 20cm x 20cm, not exceeding one litre, before arrival at the terminal. They are however available if you forget to bring your own. The bag must be one litre, which is around half the size of a standard A4 piece of paper and it must be sealable. Water and other drinks, soups, syrups. Always check in any liquid over 100ml and if you’re unsure whether an item will be allowed through, please always check it in with your hold luggage. Please note – if you wish to bring your own containers to hold 100ml or less, the container must have printed on it the measurement that the container can hold. Travel sets of containers that do not have measurements on them will not be allowed through security. Handwritten measurements or stickers are also not acceptable. If you’re flying to the USA please ensure electrical devices are charged and capable of being switched on. When travelling with a baby you’re allowed to take enough baby food, baby milk and sterilised water for the journey. In some cases this will be over 100ml. Individual containers of breast milk must hold no more than 2,000ml. Each container will need to be screened at the security point. Airport staff might need to open the containers to screen the liquids. A passenger may take prescription medication in containers over 100ml through security, provided that they have a prescription or doctors note for the medication. The passenger may only carry through security the quantity of liquid medication that is required for their journey. Hold luggage (what you check in) and hand luggage (what you take on the plane) must be below a certain weight and size. Please check with your airline for more information. Do not pack sharp objects. Do not carry items for other people. Do not leave your baggage unattended at any time. Toy or replica guns (plastic or metal). Knives with blades more than 6cm. Lighter top-up fuel (passengers are allowed to carry one disposable lighter in a clear re-sealable plastic bag). Scissors – specifically, blades measuring greater than 6cm in length. Hypodermic syringes (unless supported by medical evidence). Billiard, snooker or pool cues. Gas cartridges, or gas cartridge re-fills.